Click here to visit the Channel site and scroll down a bit. 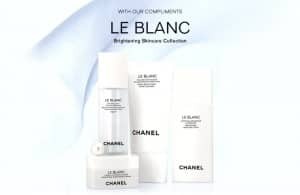 Then just fill out the form to request a free Four Piece Deluxe CHANEL LE BLANC Sample Set. Image Credit: Chanel; thanks Becky! sure love what u do! It says the page is unavailable? Thank you! Got it! I had to reload several times before the page would work, so keep trying! I would absolutely love to have a sample…Thank you so much!! Link leads to a 403 forbidden message screen. I keep getting an error saying I don’t have access to the link. I so wanted to get this sample. Thank you, worked pretty quickly for me. I would love a free sample! Chanel rocks! Just ordered the sample set -I can’t wait to try it! I wouldlove to try a sample set! Thankuyou! Thank you. I look forward to this sample. Load time was great today…yesterday I couldn’t get it to load at all. Looking forward to my sample set. It worked for me. Can’t wait to get it. Can not get it help!! My request went thru like a charm!! Can’t wait for samples! IT WORKED!!!!!! SAID I WILL RECIEVE IT SOON. Has anyone received this sample yet?? Still waiting for mine.